A commercial irrigation technique we like to use for dealing with stormwater runoff is creating a rain garden. It’s catching on in urban areas as a means of preventing flooding and giving businesses a lush, relaxed look. It adds water to local aquifers, too, and that aids everyone. If you are interested in adding one to your business landscape, read on. Rain gardens are planted depressions that are designed to absorb rainfall and stormwater runoff, along with the excess nutrients that come with them. The EPA calls them a “low impact development,” and encourages them as a good way to deal with runoff. 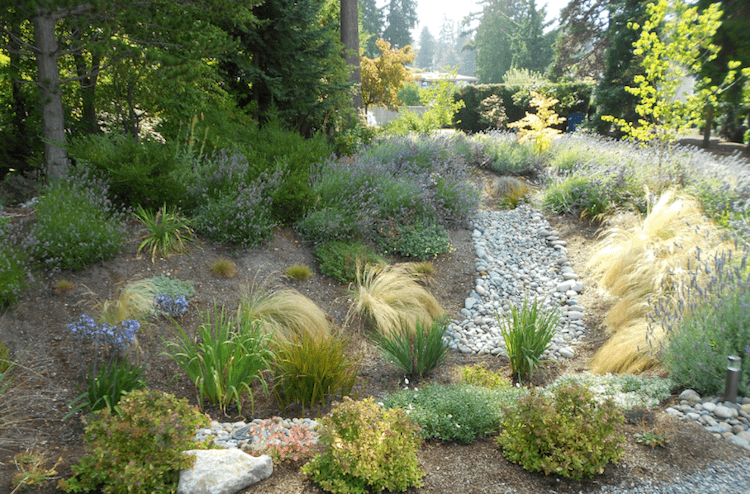 An entire yard can act as a rain garden if you have it made with water runoff in mind. Landscapers plant them with perennials and native plants that can withstand extra moisture and will act as natural filters for all the water it collects. 1. Location, location, location. Just as with real estate, picking the right spot for your rain garden can make or break a landscape. You need to place it in a sunny spot where it will catch the most runoff, but not too close to foot traffic or your building. You will want to place your garden away from utilities, building foundations, and septic systems. The biggest factor in all this is how well the soil on your property drains. If your yard doesn’t have anywhere with good, permeable soil, some of it will need replacing with a mix of compost, topsoil and sand. Another point about location is slope placement and the drainability of the soil. Slope affects how well a place drains and the direction the water, not to mention how it looks. 2. Size. You will frequently see rain gardens with a surface size about 5 to 10 percent of the impervious surface that is generating the runoff. This is just a guideline, though. Each landscape has its own demands when it comes to size, and we would want to survey your whole property before deciding on your sizing needs. 3. Depth. Most rain gardens need to be about 4 to 8 inches deep in order to deal with the storms we get in Virginia. The depth really depends on the surface area, though. The idea is to get rainwater to spread out in a thin layer so that the ground absorbs the water evenly. What Plants Will Go In The Garden? You have a business to run, so you probably don’t want to spend hours taking care of a rain garden. We can do the heavy lifting for you, and they don’t really require much work anyway. After the first year, the plants won’t need any watering, and the only addition to the garden anyone needs to make is shredded wood mulch to keep out weeds and retain moisture. If a rain garden sounds like a good addition to your commercial property, contact us. We have a highly-trained staff that will answer any questions about rain gardens and their impacts on water management.